I experienced it 9 years ago when I had The Jord, managed to bypass it with The Frog, but descended into those black depths after having Blossom. One of my worst parenting moments occurred when The Jord was about a year old, he had just started waddling around on his feet. I sent a text message to Pieter telling him that I couldn't cope with life anymore and told him goodbye. It is only by God's infinite mercy and grace that Pieter took me seriously and raced home. He found me on our bed counting out antidepressant tablets (they hadn't kicked in yet) trying to figure out how many I should take and how many to give The Jord so that he wouldn't be alone until Pieter came home at around 8 o'clock that night. In my head, I was an unfit mother, after all, the Huggies and Johnson's ads on TV told me that motherhood was supposed to be a state of euphoria. Other opinions from people around me told me that it was a fact that motherhood was instinctive, the maternal instinct would always take over and tell you what to do... Even when your child screams for three solid hours. I don't know why PND occurs. I just know that your normal emotional equilibrium becomes very seriously unbalanced. You find yourself in a world of pain and panic attacks. I recall sitting on my bed, shaking and crying and not knowing why. I dreaded night time, sunsets often put me into a state of highly strung nervous tension that culminated in huge blowouts with Pieter and more shaking and crying on my part. And when a lay doctor finally diagnosed me with depression a year after The Jord's birth, I felt a sense of relief. No, I wasn't going mad, or rather... yes, I was, but it was a manageable kind of mad. Yes, what I was feeling was explainable. And I clung to that diagnosis because it offered me the first ray of hope that the nightmare motherhood seemed to be could become better. I felt so guilty that I wasn't 'whole' enough to be a good mom to The Jord and still blame myself for the social problems he experiences. I still wonder how much of the 'bonding process' was affected by all of this and how the effects are echoing even now. A year on antidepressants helped me then. But it was a long time before I could face the possibility of a second child. When I became pregnant with The Frog I planned everything. I prepared myself mentally for his birth and I believe that that helped me alot. And, with him, things happened much easier. He was my 'easy' baby. And, to a degree, he still is. Blossom was an unplanned surprise. It took me more than half my pregnancy with her to actually come to terms with the fact that I was having another child. I was angry that my life was going to spin off it's axis again. It was only when the scan revealed that I was having a little girl that I felt the first stirrings of excitement. Does this mean that I don't love my children? Or want them? Absolutely not! I love them beyond reason and wouldn't change it regardless of how frustrating motherhood can be. Nevertheless, at the moment, I am a recovering depressed mommy. I have started attending a coffee group where they are offering Cognitive Behaviour Therapy and what I have learnt on this course has revolutionised the way I approach life. And we are only two sessions into an eight session course! It's helped me to assess my thought patterns and see where the downward spiral starts. Concepts such as 'catastrophising' have changed things for me. Just by knowing where the problem lies, is helping me to get a handle on things. The picture above is an example of one of the exercises this lady did. 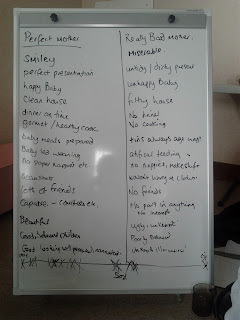 We had to list the qualities of a Good Mother and alongside the opposite, awful qualities of a Bad Mother. And then I volunteered to be the guinea pig and rate myself on a scale of 0 to 100 where I stood as a mother. 100 being a perfectly good mother and 0 being totally unfit. When I saw the results I burst into tears. In public. Because I believe that I'm an unfit mother. A belief that is backed up rather solidly by other opinions within my immediate family. You see, we believe the negative and question the positive. Moreover, we inflate the negative to encompass the positive. Whereas the facts are: I am NOT a bad or unfit mother. I am a good mother. And it doesn't matter what other people's opinions are - that's all they are... opinions. Not facts. Do I choose to believe the opinions or the facts? Do I base my relationships and interactions with my family based on a few (trashy) opinions or, do I base them on the facts? Should I continue on in an attitude of apology for inflicting my unworthy presence and insignificant self on those around me, or can I now free myself of the shackles that have bound the (surprisingly, ok) person I have become? I took that picture with my phone to remind me of who I actually am, so I can stop believing the trash. I am a human being with serious responsibilities, not a doormat. I have rights too. The right to the time it would take to paint my toenails without having to jump up to pour a cup of juice/make a sandwich/referee the screaming match happening down the hall. The right to use the bathroom alone. To actually enjoy a bath alone. To sleep through the night. To stop cleaning and have a cup of tea - without sharing it. To live according to my own standards instead of anyone else's expectations. And I'm stronger for it. And, excuse the language, those who have their expectations and opinions can shove them straight back up their ... where said opinions came from. I'm glad you can see yourself as a GOOD mother now!!! Wow. I found you through Simoney's linky. This post broke my heart, while at the same time I wanna hug you and applaud you. You are so brave to be this honest! Thankyou, just thankyou. Because I have a confession, and I feel terrible about it. 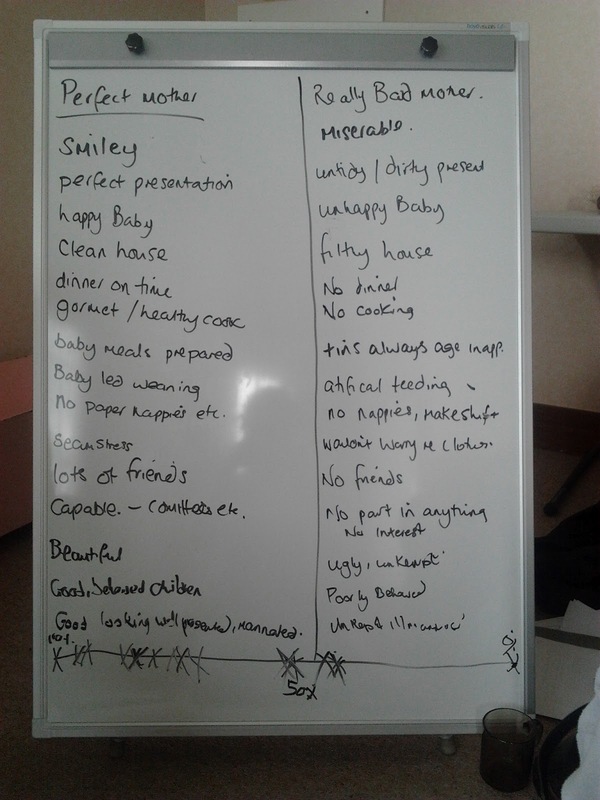 I often tell pregnant women or new mothers, when they're stressing about how they will cope with their new baby, that they shouldn't worry too much about what the books say, that their instincts will kick in and they'll know what to do. I say this to be kind, because I hate watching new mothers poring over books and pamphlets trying to find the answers, and I think it's important to encourage them to trust themselves as mothers. It NEVER occurred to me until I read this, that saying this might be destructive or harmful. I never for a second thought that I might be so so wrong. And now I feel like it should have occurred to me. I feel like an idiot! I'm glad your husband found you that day. Your story is powerful. Please please don’t feel bad about your advice to new moms! Your advice was only ever meant to be kind and encouraging, and, believe me, we need all the encouragement we can get! What if, when faced with her newborn a new mother experiences that fight or flight thing? The daunting prospect of being the whole world to another human being, combined with that huge cocktail of hormones we experience after birth triggers it. A mother with a good level of self confidence and with the correct levels of chemicals in her brain (which medical professionals claim is the cause of depression – a chemical imbalance) would be able to deal with that massive hormonal shift and the fight response would be triggered. My theory is this: (and I could be wrong, I’m no expert) mothers whose flight response is triggered by this big responsibility are probably the ones who experience depression. I believe that is what happened to me. Every time my baby cried I literally had a panic attack, and no matter what I did the crying intensified. No doubt in response to my reaction. My point is this – when I was in that place I truly believed I was an unfit mother, that I could not trust my own judgement. Not many people encouraged me to trust myself and I want to thank you on behalf of all those mothers for saying what you have said. Please keep up your encouragement. While we may not believe it for a very long time, we still need to hear it. Please don’t feel bad and thank you for your comment – it’s helping me in my recovery more than you know. First of all Hun I just want to add you are a awesome Mum and anyone that knows you knows that you are going to do the best you can for your kids no matter what. Second thing is thank you for sharing this with me and the world. I know this can't of been a easy post to write and I am still trying to figure out why I didn't see it earlier since I follow your blog here. Having had my own dealings with depression but not PND I can empathise with how you are going. It was bad enough battling my own depression let alone adding a baby into the mix. If there is ever anything I can do my friend I'm only a FB or a email or text away. Oh and the shoe fairy hopes to visit this week to Miss Blossom :).